As part of the general exploration of the New World, Spanish conquistadors set out on various expeditions in the early sixteenth century. One such expedition was led by Francisco Pizarro in 1533, heading towards the western coast of South America where it was fortunate in discovering the vast Inca empire just as it was reaching the end of a civil war. With just forty soldiers (aided by friendly native warriors), Pizarro quickly conquered much of the empire, acquired vast new territories, and set up the foundations of Peru. Just a decade later, in 1542, the viceroyalty of Peru was created to rival that of New Spain in terms of the territory and potential wealth it controlled. At its height it ruled all of western, central and southern South America, often through governors such as the captaincy general of Chile. Initial wealth was brought about through the mining and textile trades, but when Spain controlled Portugal between 1580-1640, there was no restriction on Portuguese settlement in Brazil. 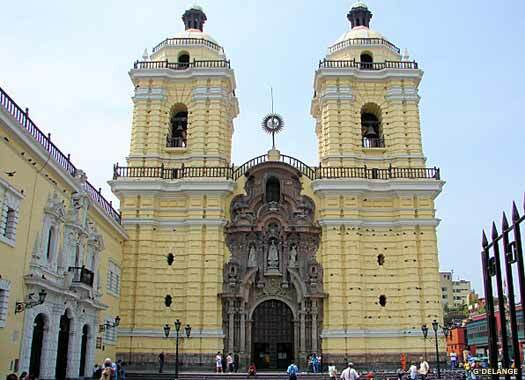 In the eighteenth century, the creation of the viceroyalties of New Granada and Rio de la Plata reduced the importance of the Peruvian capital at Lima and removed much territory from Peru's control. It also served to move some of the lucrative Andean trade to Buenos Aires. Added to the decline in productivity from the mining trade and textile production, this combination of events saw Peru lose much of its initial importance to the Spanish empire. A tentative first expedition by Francisco Pizarro to conquer Peru from his base in Panama City fails when he is forced to turn back. The second expedition in 1526 finds the northern edges of Inca territory. The third, in 1527-1528 sets up a temporary base on the edges of Inca territory, while the fourth requires a return to Spain and an interview with the king. This gains Pizarro the titles of governor and captain general of New Castile, the territory expected to be conquered by his expedition. By 1532 Pizarro is ready to head back into the lands which promise so many riches. First Spanish governor of New Castile. Assassinated. Pizarro leads his small body of troops southwards from Panama to conquer the Inca empire, opening up vast new territories in South America. Pizarro is accompanied by his siblings, Hernando and Gonzalo Pizarro. Governor of Guatemala, Pedro de Alvarado, heads to the Andes, hoping to gain the rumoured riches of Peru, but he is warned off by the men of Francisco Pizarro. In the same year, Pizarro's leadership is questioned by Diego de Almagro, and the latter man leaves, given permission by the king of Spain to explore southern Peru (modern Chile). Pizarro explores the west coast of northern Peru, and founds the city of Lima as the capital of the new territories. His brothers govern the Inca capital Qusqo (or Cusco), exhibiting great brutality towards the native subjects. An uprising results, almost recapturing the capital until the Pizarro brothers are able to defeat it. In the same year a former companion of Pizarro, Diego de Almagro, leads his band of conquistadors south into Chile in search of gold. He claims the territory for Spain but founds no cities, and returns in 1536 having abandoned his discoveries. Two years later he is executed after having failed to oust Pizarro as governor. Almagro's return to Peru sees him temporarily imprison Gonzalo and Hernando Pizarro. Once reunited, the Pizarro brothers defeat Almagro's attempts to usurp control at the Battle of Las Salinas in April 1538. Almagro is executed on 8 July. One of Pizarro's captains, Hernando de Soto, becomes governor of Cuba in 1538. Pizarro is assassinated by Almagro's followers on 26 June 1541. Gonzalo Pizarro returns from an expedition into the interior to find that the official representative of the Spanish crown has arrived to take control of Peru, and the assassins and their forces are defeated at the Battle of Chupas on 16 September 1542. In 1544, the king of Spain appoints Blasco Nunez Vela as the first viceroy of Peru (which includes the captaincy general of Chile and the New Kingdom of Granada). He introduces new laws aimed at preventing the previous exploitation of the natives and Gonzalo Pizarro rebels, with the backing of the many conquistadors who lose out under the new laws. The situation is not fully resolved until Pizarro is defeated at the Battle of Jaquijahuana in 1548 and is immediately beheaded. Half-brother of Francisco. Claimant viceroy of Peru. The viceroys continually attempt to persuade the Inca ruler to come down from his independent mountain capital and reside in his former capital at Qosqo, where he can be controlled by Spain. It takes until 1559 before Sayri Tupac does so, and he accepts Christianity at the same time. Spanish viceroy of Peru (and of New Spain 1535-1550). Died before he could take office. Toledo makes an extensive tour of the viceroyalty and reorganises it. He establishes the Inquisition in Peru (1570) and promulgates laws that treats natives and Spanish equally. In 1572, the last Inca ruler, Tupac Amaru, is arrested, tried, and beheaded. His city is burned and its location forgotten. Spain gains control of its Iberian neighbour, the kingdom of Portugal, and any attempts to prevent the Portuguese colonisation of eastern South America in Brazil are relaxed. Spanish viceroy of Peru (and of New Spain 1590-95 & 1607-11). Spanish viceroy of Peru (and of New Spain 1603-1607). Francisco de Borja y Aragon divides the government of the districts of Rio de la Plata in two, creating Buenos Aires and Paraguay, both of which remain dependencies of Peru. Spanish viceroy of Peru (and of New Spain 1612-1621). 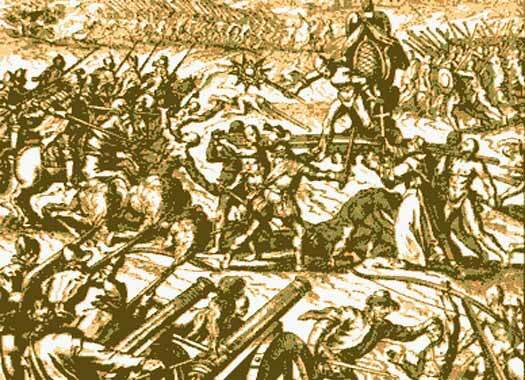 A Portuguese attack from Brazil on a Spanish mission results in the enslavement of 60,000 natives. The raid is one of a series in what is effectively a low level war of territorial conquest, despite Spain governing the Portuguese. Cabrera puts down an uprising by the native Uros and Mapuche natives. Spanish viceroy of Peru (and of New Spain 1642-1648). Spanish viceroy of Peru (and of New Spain 1650-1653). Pedro Bohorquez, a Spanish adventurer, crowns himself emperor Inca Hualpa of the Calchaqui natives, inciting their tribes to revolt. He is captured and eventually hung and beheaded. Rich landowners also chose this period to revolt against the government. The English privateer Henry Morgan takes the Peruvian port of Chagres, before capturing and sacking the city of Panama in Granada. President of the Audiencia, resumed interim vice-regency. Archbishop of Lima (and interim governor of New Granada 1671). Spanish viceroy of Peru (and of New Spain 1686-1688). President of the Audiencia governing on an interim basis. The viceroyalty of New Granada is created from Peru's northern territories, Bogota, Panama, and Quito. The viceroyalty of New Granada is recreated on a permanent basis. There is a native uprising under the leadership of Juan Santos Atahualpa in the Andean jungle provinces of Tarma and Jauja. Although Atahualpa dies in 1756, the area is not fully regained until the 1780s. The Treaty of Madrid between Portugal and Spain legitimises the established borders of the colonial territories in Peru and Brazil. The treaty also stipulates that Spain receives the Sacramento Colony and Portugal the Misiones Orientales, seven independent Jesuit missions in the upper River Uruguay. Spain and Portugal combine forces and crush the resisting colonies in the Guarani War of 1756 (as shown in the film, 'The Mission'). The viceroyalty of Rio de la Plata is created from Peru's southern territories, Argentina, Bolivia, Paraguay, and the Eastern Strip (Uruguay). Spanish viceroy of Peru (and of New Granada 1773-1776). Shortly after Manuel de Guiror is removed from office by the Crown's inspector, the Inca begin an uprising in Peru led by Jose Gabriel Condorcanqui Noguera under the name Tupac Amaru II. It is a result of oppressive Spanish control, and it takes the new governor a year of fighting to regain control. Known as the Tupac Amaru Rebellion, its leader is killed during the fighting against the Spanish with the result that he becomes a near-mythical figure in the Peruvian struggle for independence. Named viceroy of Rio de la Plata in 1804 but took Peru instead. Following the French occupation of Spain and the subsequent weakening of the crown, various wars of independence break out across the Spanish Americas, including New Spain and Guatemala. Peru serves as a centre for the royalist opposition to these revolts. When Buenos Aires revolts in May, Abascal reincorporates the provinces of Chile, Cordoba, La Paz and Potosi (both in modern Bolivia), and Quito (part of New Granada) from Rio de la Plata. On 8 September 1820, the Liberation Expedition of Peru is organised in Chile and lands on the beach near the city of Pisco in Peru, under the command of Jose de San Martin. Lima is occupied on 21 July 1821 after negotiations with the viceroy fail. The independence of Peru from Spain is proclaimed on 28 July, with the viceroy retiring to Cusco with a sizable armed force under his command. Despite temporarily recovering Lima, the acting viceroy is defeated in open battle against nationalist leader Simon Bolivar. 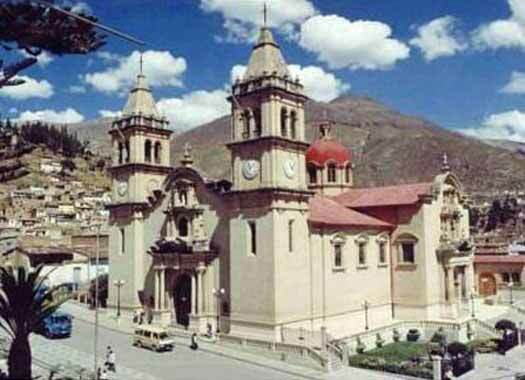 Royalist control of Peru is reduced to a small area around the city of Ayacucho, in the south-central highlands. On 9 December the Battle of Ayacucho (or the Battle of La Quinua), is won by the nationalists under Antonio Jose de Sucre, Bolivar's lieutenant, at Pampa de La Quinua, close to Ayacucho. The viceroy, Serna, captured after the battle, agrees that the Spanish will leave Peru. Juan Pio de Tristan y Moscoso assumes the office of provisional viceroy in order to transfer power to the nationalists. Nominal viceroy, but not exercising power. Died 1860. The early years of the new republic were marked by power struggles. A provisional government was formed between 1821-1822, with a republic being declared in 1822. Elected president in 1824, the former nationalist leader Simon Bolivar turned created a dictatorship four years later, but his governance was also very short-lived. In fact, Peru's nineteenth century history was scarred by repeated dictatorships. The name Peru originates from that of a native ruler who lived near the Bay of San Miguel in Panama in the earliest days of exploration into South America. In 1522 Biru was visited by Spanish explorers who were venturing into new territory for the colonists, and the name came to be used to designate all of the initial conquests to the south. In modern times the country's population is a reflection of that colonial period, consisting of the descendants of European settlers and African slaves, native Amerindians, and Asians. After the provisional government creates a republic in 1822, the Peruvian congress names the president of Gran Colombia, Simon Bolivar, president of Peru on 10 February 1824. He is able to reorganise the armed forces and decisively defeat the Spanish at the Battle of Ayacucho in that year. Also president of Bolivia & Gran Colombia. During Bolivar's presidency, in 1825 the Congress of Upper Peru creates the republic of Bolivia, which is named after him. Trying to prevent the break-up of Gran Colombia, he proclaims himself dictator on 27 August 1828, but the following year Peru fights Gran Colombia over the latter's claim that its territory extends beyond the Andes mountain range to the River Amazon, and includes the Amazonian basin. The war is ended with the Battle of Tarqui and the Gual-Larrea Treaty being signed on 22 September. The treaty specifies that the Colombian-Peruvian border is to retain the line it bore under Spanish colonial control (the peace lasts until 1859). 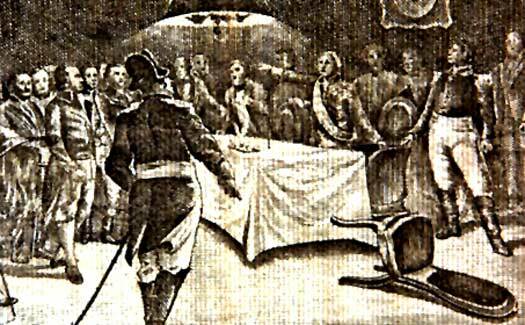 Bolivar resigns the post of dictator on 27 April 1830 after an assassination attempt dents his confidence. A coup by Pedro Pablo Bermudez is succeeded by a second coup under Felipe Santiago Salaverry on 23 February 1835, leading to a further year of dictatorship. Salaverry is defeated and executed by Bolivian forces which invade the country. Juan Pio de Tristan y Moscoso, having chosen to remain in Peru after independence, participates in the creation of the Peruvian-Bolivian Confederation which survives until 1839. Dictator. Deposed in a second coup. The dictator of Peru is defeated and executed by Bolivian forces which invade the country. Marshal Andres de Santa Cruz creates the Peruvian-Bolivian Confederation which survives until 1839. Tension between the confederation and Chile leads to the latter declaring war on 28 December 1836. 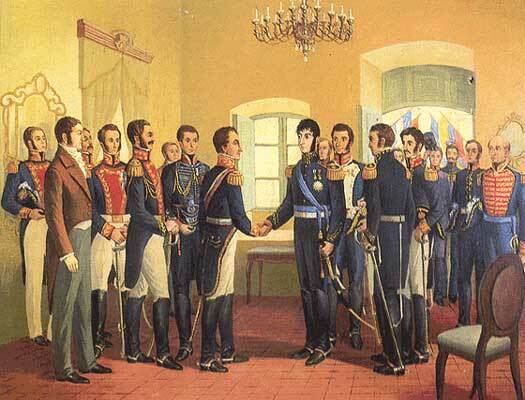 Chile's ally, the Argentine confederation, follows suit on 9 May 1837. Eventual defeat for Bolivia comes in 1839 and Santa Cruz flees to Ecuador. A period of stability within Peru follows. In 1841, the new Peruvian president attempts to return the favour by invading Bolivia, but he is defeated and killed. Arguing that treaties signed with Gran Colombia have been rendered void upon the dissolution of that federation, Peru fights another war over disputed territory bordering the Amazon, this time with the federation's successor in the region, Ecuador. Dictator or 'interim president'. Deposed. With the resources which had made the country stable since the 1830s having been squandered, Peru is now heavily indebted and political in-fighting is on the rise. A dictatorship is formed under Prado after a coup removes the previous dictator. Spain recognises the independence of Peru in 1879. Another dictatorship is formed almost immediately under Nicolas de Pierola, but his Peru is defeated by Chile in the War of the Pacific between 1879-1883. After Lima is occupied, the country loses the provinces of Arica and Tarapaca. Internal struggles following the war are followed by a period of stability under the Civilista Party. Dictator. Defeated by Chilean forces and resigned. On 29 May, supporters of the opposition Democratic Party force their way into the presidential palace to demand the president's resignation. However, Augusto Leguia refuses and is kidnapped and taken to the Bolivar Monument where he repeats his refusal to resign. The police arrive and rescue the president by force in a battle which results in over a hundred deaths. During the same period the country's border with Brazil is settled with the signing of the Treaty of Velarde-Rio Branco. This sets the border along the rivers of Yaravi and Yaverija. In the case of Bolivia, the Treaty of Polo-Bustamante formally partitions Lake Titicaca, and also marks the boundary with Tacna (which until then had been part of Chile). In October 1917, Peru declares for the allies in the First World War against Germany and the Austro-Hungarian empire, but plays no active part in the conflict. Leguia returns to office and, fearing the government will not recognise his re-election as president, launches a successful military coup. From there, a new parliament is convened which elects him constitutional president. Leguia introduces a new, more liberal constitution and proceeds to ignore it himself, ruling in dictatorial style. Dictator. Overthrown during the world economic depression. With the signing of the Treaty of Salomon-Lozano, Leguia agrees the borders with Colombia by seceding all territory between the Putumayo and Caqueta rivers, to the detriment of both Peru and Ecuador. The treaty is only published after the overthrow of Leguia on 22 August 1930. In March 1932 the president, Luis Sanchez, is the target of an attempted assassination as he leaves church. The assassin misses his target and the president almost shoots him in return, only being stopped by his bodyguards. In June a minor revolt is put down, and in September a revolt seizes a whole town. By the end of that month, the Treaty of Salomon-Lozano has been declared null and void and Peru and Colombia prepare for war, although it is never announced as such. Before hostilities can commence, on 30 April 1933, Sanchez is shot through the heart as he finishes reviewing twenty thousand young army recruits. His replacement negotiates peace with Colombia (by 1934) and introduces a new constitution. The Ecuadorian-Peruvian War is fought between 5 July 1941 and 31 July 1942 as a continuation of the 1840 war. The Rio Protocol brings peace until 1960. In 1942 Peru also becomes the first South American nation to declare war against Germany and its allies. Despite having a president who has attempted to liberalise the country, in October 1948, rebel sailors and officers seize five warships, locking up or shooting their commanders, and send landing parties ashore under cover of a ragged bombardment. Sailors already on shore take over the Naval Academy, the Naval Armoury, and the Real Felipe Fortress. Troops loyal to the government crush the revolt and the president, Jose Bustamante, suspends all civil rights. It is not enough for the military cabinet who, responding to economic strife, stage a coup on 29 October. The coup leader takes over as president. Dictator. Arranged elections in 1956 and stepped down. President Velaco declares the Rio Protocol with Ecuador to be null and void, although little immediate impact is caused by the decision. Another coup, this time by Ricardo Perez Godoy and Nicolas Lindley Lopez, both generals in the Peruvian army, delivers a year of government by military junta under Godoy. He is deposed by Lindley who delivers democratic elections to the country, turning over the office of president to election winner Fernando Belaunde. Dictator. Overthrown by his coup co-conspirators. Dictator. Arranged free elections for the same year. Belaunde is removed from office in a military coup. The country is ruled by the army under General Velasco, who manages to destroy the economy. Dictator. Overthrown in a coup. Dictator. Stepped down after elections. With the country in economic depression, the military allows an election to restore constitutional rule. Fernando Belaunde's return fails to halt the rise of internal conflict, especially by the left-wing Shining Path movement. However, he comes to be regarded as the father of Peru's modern democracy. Following the sudden and unexpected occupation by Argentina of the Falkland Islands, Peru promises support while Chile sides with Britain. President Alan Garcia's presidency leaves the country with hyperinflation and no progress against the growing Shining Path rebel movement. Garcia also has the question of his involvement in human rights abuses hanging over his head. He is replaced by the half-Japanese president, Alberto Fujimori. A new constitution is drafted. The aftermath of the 1995 Cenepa War between Peru and Ecuador sees one of the western hemisphere's longest territorial disputes reach a final conclusion. On 26 October 1998 both countries sign a definitive peace agreement. Fujimori has fared little better than his predecessor on the human rights issue, although he has brought an end to Shining Path's fifteen year reign of terror and has noticeably improved the economy. Now facing a corruption scandal, he flees to Japan. Following a visit to Chile in 2005 he is arrested and faces deportation to Peru. Alan Garcia regains power, still with questions hanging over him regarding his conduct. However, he is regarded as the lesser of two evils by voters who are more worried by Venezuela gaining political influence over the country. In 2007, former president Fujimori is handed over to Peru to face charges and imprisonment for six years.